- FrancesCassandra: UK fashion, beauty and lifestyle blog. 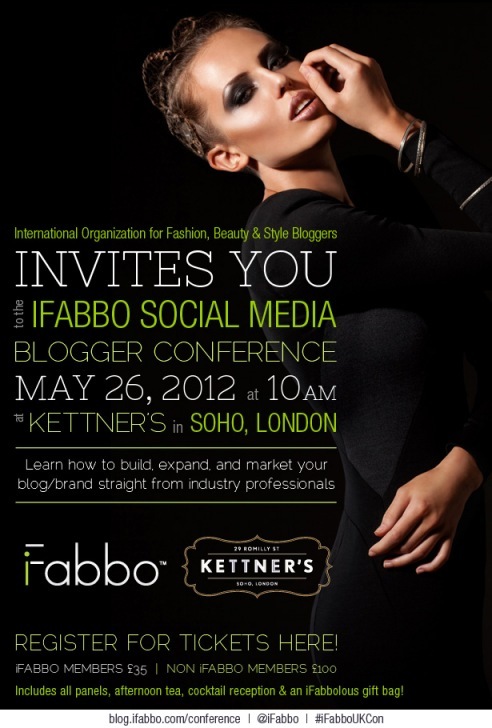 : iFabbo Social Media Conference. Just thought I would write a quick post to see if any of you are attending the iFabbo Social Media Conference in London later on this month. For those of you who may not know what it is, it is a conference day with five panels consisting of expert speakers who will be there to try and help you maximise your blog, from taking quality photographs, to forming relationships with PRs, to how to use social media effectively. There will also be afternoon tea and a cocktail hour to allow you to meet and mingle with the members of the panel and other bloggers, and there will be goodie bags (or "swag bags" as they've been called) which I hear contain some very exciting things so far. Tickets for bloggers cost £35.00, I bought mine last night and I am really excited for the day now, I am looking forward to learning some blogging tips and advice, and of course meeting other bloggers. You can find much more information and purchase tickets at the official page here. Seems interesting but a bit pricey! I really want to go this, but i can't make it that weekend. You'll have to do a post and tell us what it was like and what goodies you get in the swag bag. Gutted i can't go, hope you have a lovely time there though! Sounds really fun! I will have to look and see if they offer any of these in the US:) I am now following you, would you like to follow each other? I would love to go to this but it seems a bit pricey and I live in Newcastle! Have fun it sounds awesome!